Want a Mexican-Inspired Brunch!? All you need is some guacamole, salsa, and tortillas to pair with your morning eggs! Ole! In a medium bowl combine first seven ingredients and place in a fine sieve to drain for about 10 minutes. Remove half of salsa mixture and place in an IMUSA SALSA BOWL and set aside. Place half of remaining salsa mixture in a separate bowl and add mashed avocados and jalapeno. Mix gently until combined. Place guacamole inside second IMUSA SALSA BOWL and set aside. In a medium bowl beat the eggs and add remaining salsa and grated cheese. Heat a non-stick IMUSA SAUTÉ PAN on medium heat and add oil. Cook scrambled eggs using a rubber spatula until it’s just under cooked. Place eggs in a third IMUSA SALSA BOWL. Heat tortillas in the IMUSA TORTILLA WARMER. Place a damp paper towel inside the base of your IMUSA TORTILLA WARMER and place the tortillas on top. Place the tortilla warmer without the top inside of your microwave and microwave on high for 30-60 seconds. 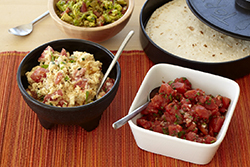 Cover the tortilla warmer and serve them with the salsa, guacamole, and eggs.